I was quite satisfied with today’s update from City of London Investment (CLIG), my largest holding. The emerging-market fund manager confirmed its assets under management (AUM) had improved from $3.9bn to $4.0bn during the six months to December 2014, a period when the group’s emerging-market benchmark index dropped 8%. Although today’s statement revealed slightly reduced profit guidance for the current year, new projections for the subsequent twelve months (to June 2016) appear quite promising. I’m reassured all my sums continue to point to a maintained 24p per share dividend and a bumper 7%-plus yield at 325p. I mean, just how many companies do you know are confident enough to publish this level of insight? 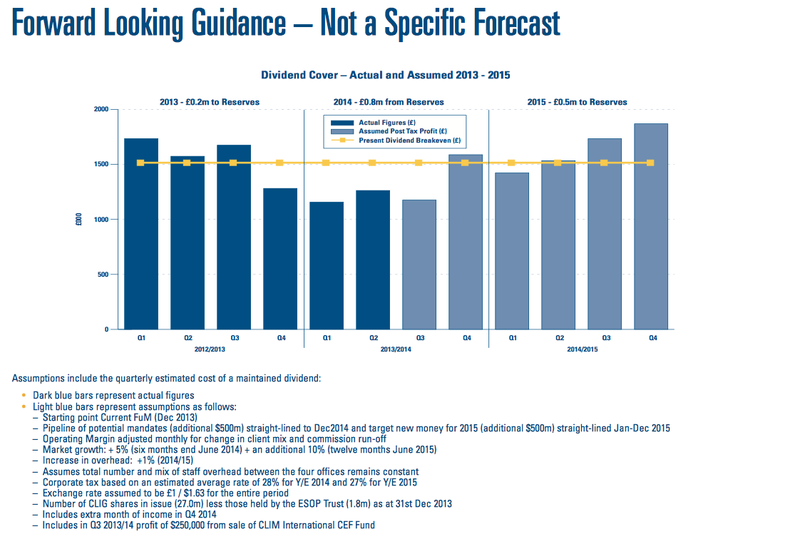 In fact, the above July 2014 guidance essentially carried a profit upgrade. 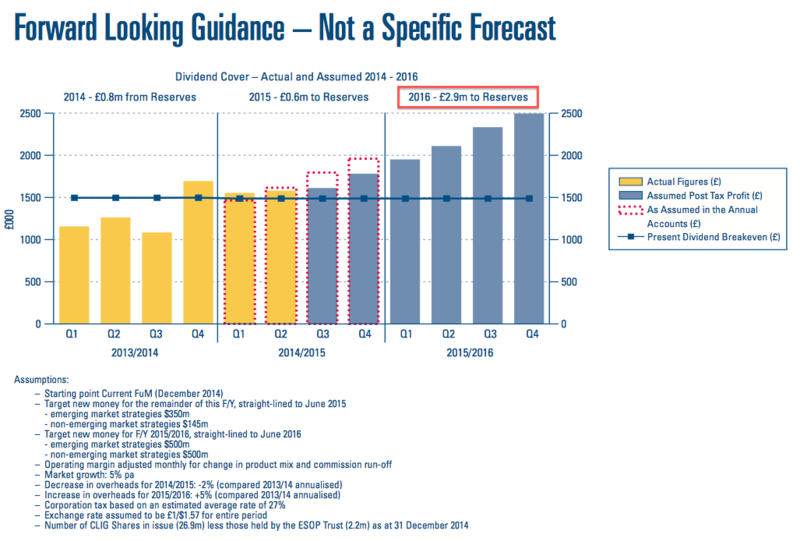 You can see for 2015, in that red box above, that the projected ‘transfer to reserves’ — profits retained after paying the dividend — had improved from the earlier £0.5m to £0.8m. In other words, CLIG then reckoned earnings for the year to June 2015 could be £7.2m (the £6.4m dividend plus the £0.8m transfer), or almost 27p per share. However, the forward earnings guidance issued today has effectively trimmed that £7.2m projection to £7.0m or 26p per share. You see, the ‘transfer to reserves’ for 2015 has now been cut from £0.8m to £0.6m (as per the red box below). The next chart explains why a trim was needed. 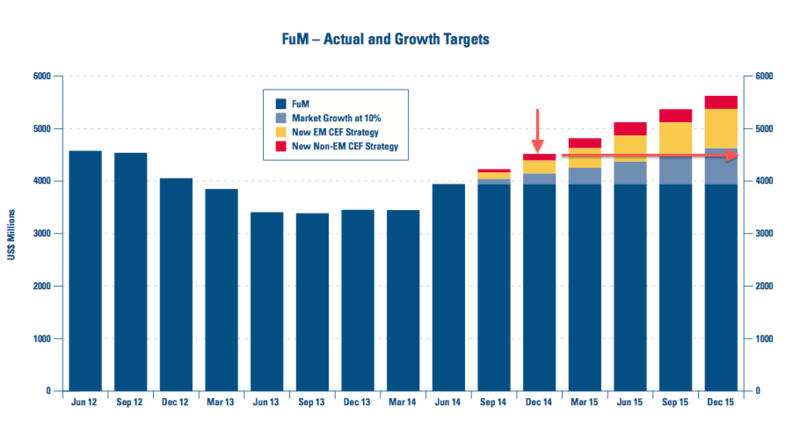 CLIG had been predicting AUM at the end of December 2014 was going to be $4.5bn — some $0.5bn ahead of the actual figure announced today. The rate of new client wins being slower than expected (CLIG had targeted winning an extra $750m of AUM during the year to June 2015, and the firm is is at least $120m behind schedule). Thankfully my investment decisions have always been based on CLIG’s reported AUM levels and not its projected ones. As such, I am not too disappointed by the revised guidance. You will see for 2016, in the big red box above, the transfer to reserves is £2.9m. Add on the current £6.4m dividend (at 24p per share) and CLIG is essentially targeting earnings of £9.3m or roughly 34p per share for the year to June 2016. It’s ambitious stuff, and is based on emerging markets growing 5% a year and extra client money of $1.45bn taking total AUM to almost $5.5bn. Your guess is as good as mine as to whether CLIG’s targets are achievable, but I’d like to think the managers here would never publish guidance that was totally out of reach. 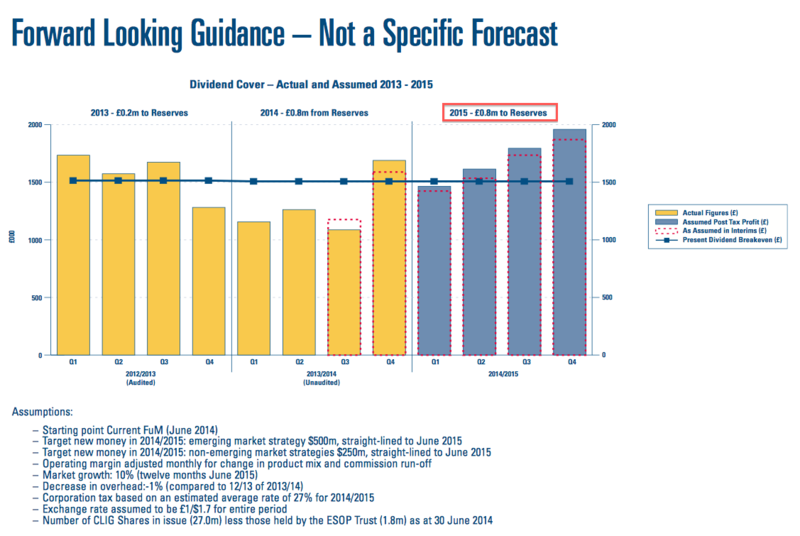 We’ve already seen CLIG’s revised forward guidance for 2015 project earnings of £7.0m or 26p per share. Meanwhile, today’s statement also claimed pre-tax profits for the six months to December 2014 could be £4.3m. Doubled up to £8.6m and taxed at CLIG’s indicated 27%, earnings could be 23p per share. CLIG: Helpful profit forecast table. Please click to enlarge. I make AUM of $4.0bn plus a £1.$1.53 exchange rate gives earnings of £6.7m or 25p per share. All the above calculations suggest to me CLIG’s dividend can be sustained at 24p per share — and deliver that 7%-plus yield — given the group’s declared “flexibility” when it comes to dividend cover. Depending on the earnings prediction chosen, I make the P/E at 325p to be something like 11-12 adjusted for the group’s £10m/38p per share cash hoard. 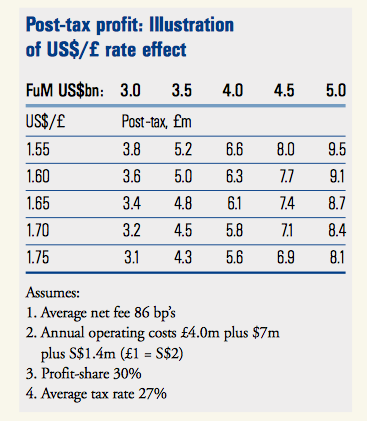 (If you believe my sums that adjust for CLIG’s legacy marketing costs, then the underlying P/E could be 10. 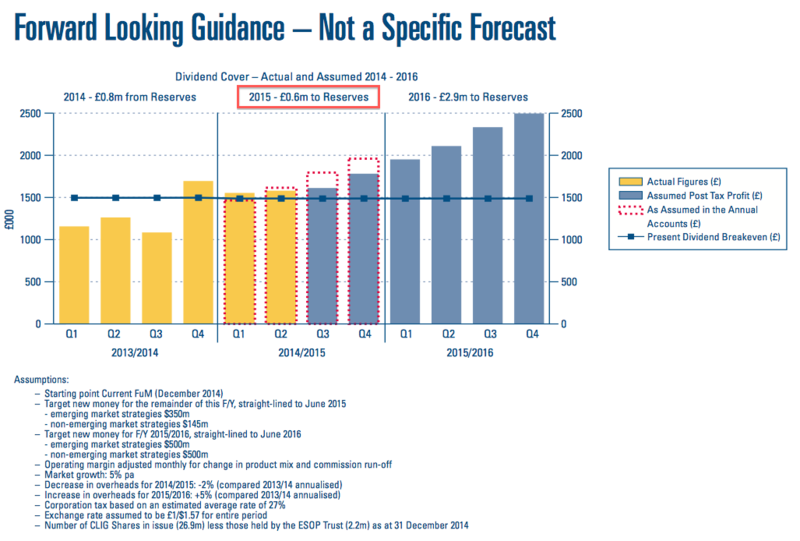 And if you believe CLIG’s 2016 target guidance of 34p per share, the underlying P/E could be 8). That’s because all the facts and figures are there and it is really quite simple to construct various profit outcomes. Of course, whether those outcomes actually come good can be dependent on market fluctuations — which have partly prompted CLIG to revise down its current-year expectations today. I am aware further market ructions could hurt this business. But for now, management’s open and straightforward attitude towards shareholders, the group’s reasonable progress of late, the attractive accounts and that generous dividend continue to make CLIG a firm favourite for me. This entry was posted in City of London Investment, My Shares on January 6, 2015 by Maynard Paton. Thank you for sharing and most appreciated. CLIG is one of my biggest holdings and it has been good to me – thanks to you. Management’s transparency is refreshing, I only wish all my other holdings can have this level of transparency. No problem Mohammed. I too share your wish!